Square foot gardening is the ultimate urban or small space garden solution. I read a book a few years ago by Mel Bartholomew and it completely changed the way I designed many of my garden beds. I needed a solution to living in a house in Los Angeles that had a small backyard which only gave me about 10x12 foot space to garden in. Now that I have a much large property to grow flowers and vegetables, I still use Mel's idea of square foot gardening method. I keep an above ground patio garden just outside of my kitchen door. I still grow plenty of produce in rows particularly if I want a large abundance of onions, melons, carrots, beets etc. but, my small patio garden enables me to grow all of my herbs, mesclun lettuce, a few tomatoe, pepper and a good amount of bunching onion and radish. I also like to grow unusual varieties of radish or lettuce in small amounts to see if I even like them instead of wasting time and energy in planting an entire row. The original book that I read and still own was published in 1981. Mel has updated that book and it's now available on Amazon.com. It's called All New Square Foot Gardening by Mel Bartholomew. I'm excited to have purchased The Square Foot Gardening Answer Book. The Square foot gardener and author Mel Bartholomew also once hosted a television series on PBS public television. 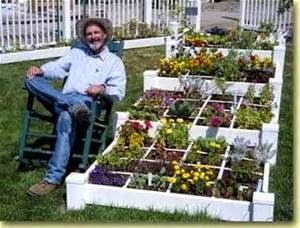 He created the idea of gardening in a 4′ x 4′ square area that is subdivided into a grid of sixteen 1′ squares. Mel’s system can be used in a raised bed or in ground garden. 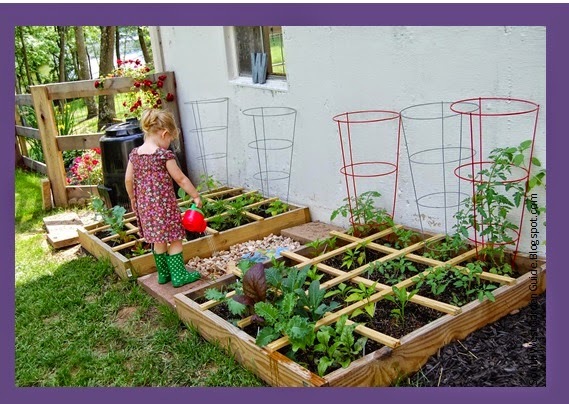 Square foot gardening also incorporates plants like cucumbers that grow vertical on trellises. You can easily accommodate vine vegetables as like tomatoes, beans, melons, pumpkins and squash in a square foot garden. 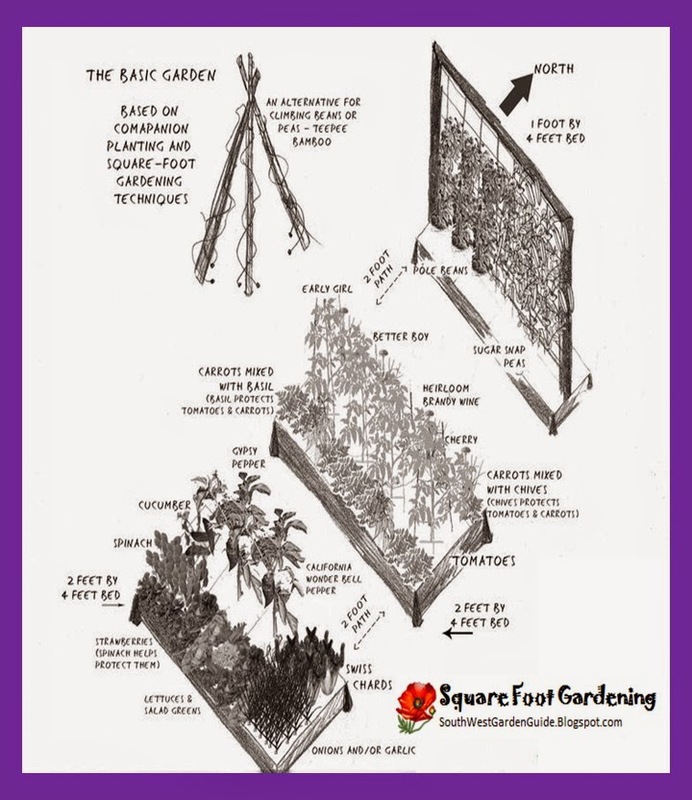 Down below is a square foot garden chart to give you a better idea of how Mel Bartholomew's method works. His book is copyrighted and I'm not able to post his actual graphics. His method is easy to understand and most ideal for the urban gardener who only has a small space to work with. You can grow so many vegetables, herbs and flowers within one square foot and eliminate wasted space between rows. Mel's books give you grids and graphs of what particular vegetables work well together in one square foot. I've used them so often that I've actually xeroxed the photos and laminated them. So when I go out to my gardens I have them on hand. It's amazing how he even thought about how to incorporate root vegetables like beets into his square foot garden method. They fit nicely with lettuce that tends to grow shallow roots. He explains plants that are compatible because, they share either the same water,shade or sunshine needs. There is another square foot garden book available written by another author named James Givens and It's only priced at $2.99 on Amazon. It has the same principles as Mel's book and shows some really good photos as well. I recommend reading and owning Mel's or James Givens' books because of the grids and graphs listed. They're easy to read and have lot of great ideas. I keep a copy of Mel's book in my garden shed. You'll ask yourself why you didn't read this before. It's amazing how many vegetables can be produced in one square foot. Mel Bartholomew and James Givens both have good books but, Mel writes best for beginner or novice gardener. He's very interested in helping people who live in urban areas particularly apartments or small homes which only have a few feet available to grow anything. 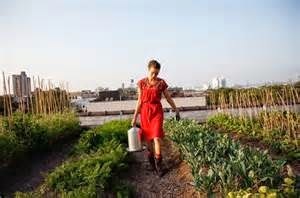 People even use Mel's square foot garden method to grow flowers, herbs and vegetables in roof top gardens. There's restaurants across the country that are using Mel's garden method on their own rooftops. Mel also has a modest website that sort of looks like it was created back in the 90s by a part-time, high-school intern, but it offers a good overview of the square gardening system. I haven't read his new cookbook yet. If anyone has, be sure to let me know if it's worth purchasing or not. 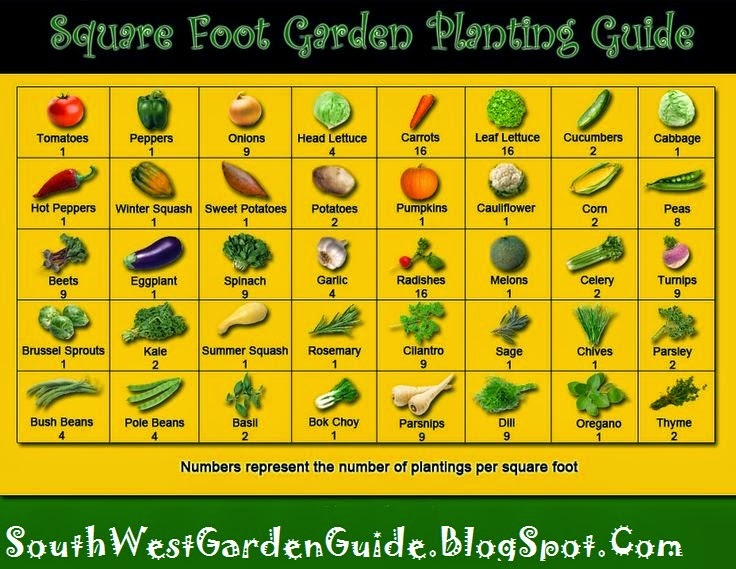 Here's a chart to give you an idea of how many vegetables fit into a one square foot space.